We might go so far as to say it's the best sampled piano we've ever heard, and at this price, any serious digital pianist needs to check it out at the earliest opportunity. Intuitive, easy to use and powerful. The American Concert D soundbank is absolutely stunning. Comprising just one piano, this 49GB multisampled acoustic piano is the largest single instrument in Synthogy's now-quite-expansive Ivory roster. It captures every nuance of a 1951 New York Steinway D, including the full sustains of its longest notes - some of which last for up to two minutes! 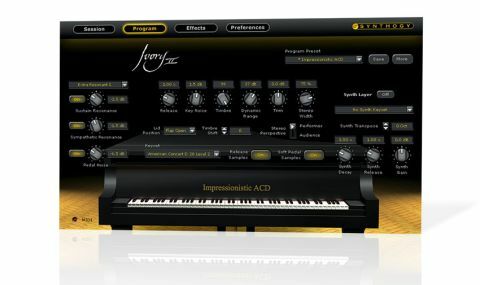 "The jewel in Ivory II's crown is the Harmonic Resonance Modelling system, which emulates the sympathetic string vibration of the real thing"
While the sheer scale of the soundbank and the pristinely engineered recordings it contains ensure that the core of American Concert D is fastidiously representative of the real thing, Ivory II's ugly but well-equipped interface enables a great level of sonic customisation. The jewel in Ivory II's DSP crown is the Harmonic Resonance Modelling system, which emulates the sympathetic string vibration of the real thing, the result being a full, harmonically engaging sound that really does help to elevate this above your average piano ROMpler. A range of DSP-generated soundboard types is also available for adjusting the resonance characteristic of sustained notes, and further core controls include Timbre (tone), Stereo Width, a choice of five Lid Positions and noise levels for keys and pedals. There are also some decent effects built in - shelving/parametric EQ, chorus and reverb - and an array of 'front panel' performance parameters, such as transposition, velocity mapping, memory usage, polyphony, etc. Finally, should you want to steep your piano in New Age syrup (no, neither do we), you can mix in one of eight preset synth pad layers, complete with Decay and Release controls.